Just two months before the September 11 terrorist attacks, Dr. Judy Melinek began her training as a New York City forensic pathologist. With her husband T.J. and their toddler Daniel holding down the home front, Judy threw herself into the fascinating world of death investigation-performing autopsies, investigating death scenes, counselling grieving relatives. 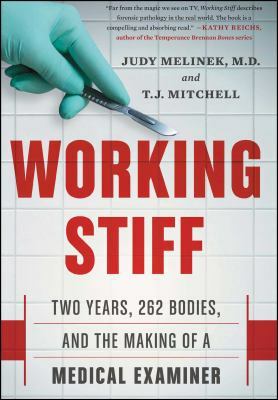 Working Stiff chronicles Judy's two years of training, taking readers behind the police tape of some of the most harrowing deaths in the Big Apple, including a first-hand account of the events of September 11, the subsequent anthrax bio-terrorism attack, and the disastrous crash of American Airlines flight 587. Lively, action-packed, and loaded with mordant wit,Working Stiff offers a first-hand account of daily life in one of America's most arduous professions, and the unexpected challenges of shuttling between the domains of the living and the dead. The body never lies-and through the murders, accidents, and suicides that land on her table, Dr. Melinek lays bare the truth behind the glamorized depictions of autopsy work on shows likeCSIandLaw & Orderto reveal the secret story of the real morgue.